Agronomy is one of the principal branch of agricultural sciences, which deals with the principles, and practices of crop production and field management. The Agronomy section in the college is basically deals with the work of teaching to the students, research and training to the extension workers and farmers. 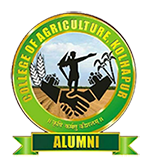 The Division of Agronomy College of Agriculture, Kolhapur was established during the year 1963. The main farm is situated at "Unchgaon". The total land of Agronomy farm is 29.03 ha. Out of this 18.99 ha. is under cultivation. The Agro physical features of the farm are narrated as below.